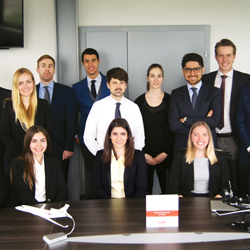 Geneva-headquartered LunaJets is proud to have been awarded 'Best Employer 2018 in Switzerland' by financial magazine Bilan in the category of start-ups with up to 50 employees. The survey recognises best human resources practices and LunaJets provides employees with several advantages that it says were integral to winning the prize. Each employee can not only enjoy flexible hours, training opportunities and supplementary accident insurance but they also have access to a massage therapist, a well-stocked kitchen and those staff still in the office after 8pm are offered free take-away meals at the local Italian restaurant. Moreover, the LunaJets offices are pet-friendly and staff are able to bring in their four-legged friends from time to time. There is also a rest room, a fully equipped gym with shower allowing for exercise, cycling or yoga practice, and staff have use of the company pool car, a winter ski retreat and can enjoy summer lake barbecue day and evening parties.